The Civic Center in downtown Los Angeles is where several courthouses mete out their justice, sometimes to Hollywood celebrities. 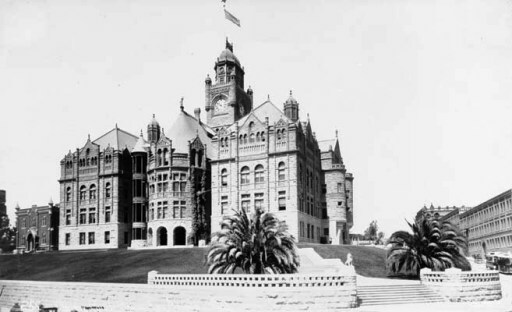 Before many of the building that now stands there were erected, there stood an old brownstone Courthouse located at Temple Street and Broadway. It stood for forty-five years until it was razed after being damaged in the Long Beach earthquake of March 1933. When it was finally demolished in 1934, it took with it the old press room and its unique Wall of Fame and the signatures of stars, who for this or that reason had been in court, or the marriage license bureau. Scrawled in either pencil or crayon, one could find the names of Charlie Chaplin, Tom Mix, George Bancroft, Harry Langdon, Eugene O’Brien, Doris Kenyon, Ethel Clayton, Constance and Natalie Talmadge, Pauline Starke, Jean Harlow and Bebe Daniels. There were a lot more and each one had its own story. Of course, not all the screen stars who appeared in court, inscribed their names on the Wall of Fame. Some, the reporters failed to corral; others could not be lured to the press room. There were some who flatly refused. 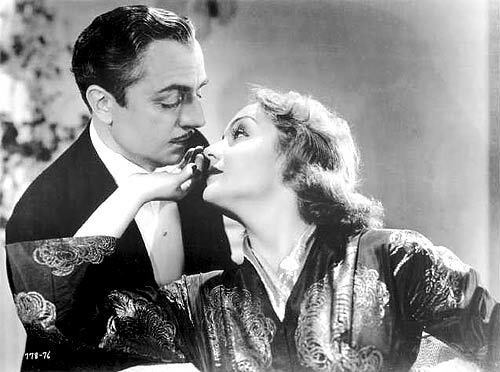 Among the latter was William Powell, who had come with Carole Lombard, for a marriage license. Powell, when confronted by the wall, glared reproachfully at the reporters and demanded: “Gentlemen, isn’t anything sacred?” The reporters thought he was kidding until he turned and stalked out of the press room fairly oozing indignation. Jack Hoxie was first to sign the wall and his signature was the largest. Oddly enough, Tom Mix’s name was one of the smallest and Charlie Chaplin’s was the hardest to read. And what did they appear for? Harry Langdon, asserting he had but $40 with which to pay $60,000 his divorced wife sought as property settlement. The case was dismissed and Harry was smiling when he signed the wall. Divorce also steered the Talmadge sisters into the press room. Natalie Talmadge was fighting Buster Keaton over custody of their children. Constance was a witness. The prolonged contests between Charlie Chaplin and Lita Grey Chaplin, also concerning the care of their children is well known. When the reporters tried to lure Lita to the press room she balked, saying she always wanted to know what she was expected to do before she went places with strangers. Besides the signature of James Quirk of Photoplay magazine, was pasted the headline announcing his death. His wife, May Allison, also signed. Reporters tried to get Paul Bern to sign the wall when he and Jean Harlow applied for their marriage license, but both refused to visit the press room because they were “radiantly happy and in a terrible hurry.” A few months later, dressed in widow’s attire, Jean returned to probate Paul Bern’s will. This time she signed the wall. Doris Kenyon, widow of Milton Sills, was considered by a majority of the court reporters, as the grandest girl to affix her signature to the Wall of Fame. They designated Polly Moran as “the hard egg with the soft heart.” Polly crashed the press room the day she appeared to legally adopt a 16-year-old boy she had taken from an orphanage when he was only a few months old. One of the funniest incidents connected with signing the wall centered on Richard Barthelmess who was suing to recover securities alleged to have been misappropriated. His wife was with him and they consented to have a picture taken together. She sat in a chair and Barthelmess stood beside her. The photographer snapped his picture and after the couple had gone, remarked to the reporters: “I think I got a good picture of that dame but I had an awful job keeping that rube out of it, he was standing so close.” The reporters, on informing him that the “rube” was Richard Barthelmess, used language which allegedly made even the signatures on the wall blush. The names of Ben Lyon and Bebe Daniels graced the wall as the result of the trial of Bebe’s lunatic lover.” Edna Murphy signed when she got her divorce from director Mervyn LeRoy. Gertrude Olmstead was a witness at the trial and also signed. The reporters recalled, however, that Gertrude was rather embarrassed by the ordeal of clambering on the table in order to write her name. George Bancroft divided honors with Jack Hoxie as the most massive man to have perpetuated his signature. He appeared in court to contest an agent’s claim for $30,000 of commissions. Hoxie had been up on alimony charges. Several of the signatures recalled the tragic death of Alma Rubens. They were obtained during the libel suit brought against Photoplay and James Quirk by Ruben’s mother, and included Eileen Percy’s and Claire Windsor’s. ZaSu Pitts was another witness, but would not sign. The reporters declared her to be the most “publicity shy” screen star they encountered. She also eluded the news-hounds when she divorced her husband, Tom Gallery. The Courthouse scribes were not certain which cases brought Tom Mix, Edwin Carewe and Mae Murray to the Wall of Fame, as their court appearances was so numerous. Legal battles over the Mix children and property disputes made Mix a familiar figure and both Mae Murray and Carewe were central figures in countless suits over property, contracts and other things. Pauline Starke’s court appearance was mainly due to the protracted battle with her former husband, Jack White. The reporters captured director Robert Vignola and Eugene O’Brien when they appeared in court as character witnesses for a young man who had gotten into trouble and Stanley Fields immortalized himself by apprehending a burglar in his apartment. Most of the females who signed the wall were space conservers. That is except Constance Cummings and Vivian Duncan, whose names stand out like sore thumbs. Cummings had just won a contract suit, while the half of the famous Duncan sisters won a divorce from Nils Asther on the ground of too much mother-in-law. Another signer brought to the wall by the divorce route was Lola Lane when she parted company with Lew Ayres. Duncan Renaldo was the only signer of the Wall of Fame who had gone to jail, though this happened later than when he actually signed the wall. His name was obtained when he was the central figure in the alienation case against Edwina Booth, which came as the aftermath to a “location” trip to Africa. 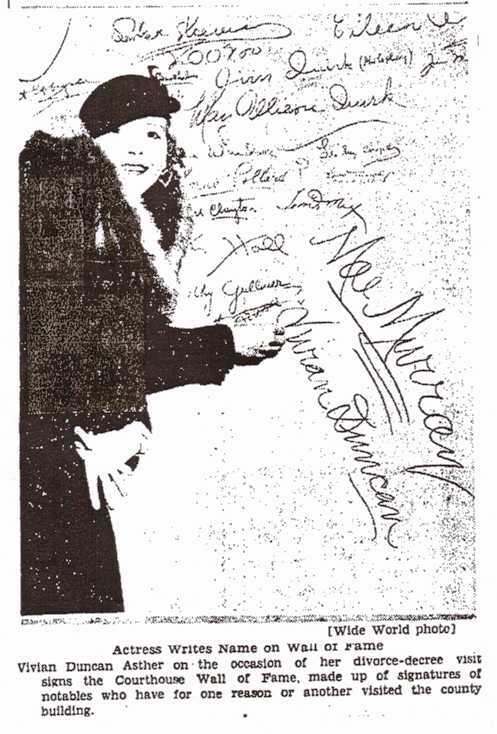 Snub Pollard also appeared on the wall as did that of Lowell Sherman, whose matrimonial adventures with Pauline Garon and later with Helene Costello brought him into the press room. When the fate of the old courthouse was sealed, the reporters lost interest in their famous wall, knowing it soon would be destroyed. The visitors of the last few months were not asked to sign. During the last two or three months there were many noteworthy eligible’s including Joan Crawford, Marlene Dietrich, Estelle Taylor, Colleen Moore and Marian Nixon. 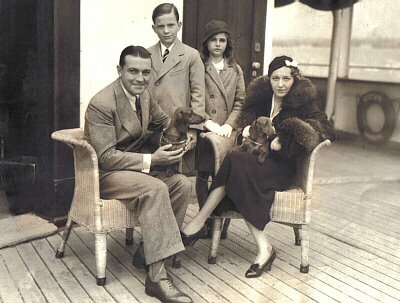 Crawford was one of the last asked to sign, the occasion being her divorce from Douglas Fairbanks, Jr. She refused. The reporters asserted she was so nervous and shaky it was doubtful if she could have written her name of the floor, much less on the wall. Signing the Wall of Fame grew to be quite a ceremonial and somewhat of an athletic function. It was necessary to step onto a chair and then mount onto a table in order to reach the designated spot and in addition to the gentlemen of the press, court attachés and sometimes the judges themselves would assemble to witness the event. In fact, gazing up at a movie star was really something to talk about afterward. It’s too bad that the Wall of Fame could not have been saved or moved to another location. When the new courthouse was built, there was another press room, but it was never the same.